[PDF] The Principles of Statistical Mechanics (Dover Books on Physics) | Free eBooks Download - EBOOKEE! Description: Referred to by every later author, used by thousands of students in the over forty years since publication, and recommended with great enthusiasm by those same students who are now professors, The Principles of Statistical Mechanics is widely recognized as the classic treatment of a subject essential to contemporary physics. 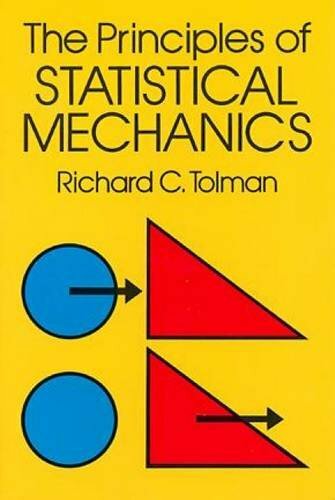 It is the definitive treatise on the fundamentals of statistical mechanics, and because it deals with the fundamentals, the material is as useful today as forty years ago. After a brief introduction, the text begins with a concise exposition of classical statistical mechanics, including such topics as Hamilton's principle, the Lagrangian function, canonical equations of motion, the fundamental theorem of Liouville, conditions for statistical equilibrium, the Maxwell-Boltzmann distribution law, collisions as a mechanism of change with time, and Boltzmann's H-theorem. There follows a thorough elucidation of quantum statistical mechanics: historical remarks, the postulates, theorems illustrating the nature of quantum mechanics, transformation theory, applications, statistical ensembles, the Maxwell-Boltzmann, Einstein-Bose, and Fermi-Dirac distributions, the change in quantum mechanical systems with time, and the quantum mechanical H-theorem. (The self-contained treatment of quantum mechanics is almost a book within a book!) The final two chapters, illuminating one of the greatest achievements of physics, discuss the application of statistical mechanics to the problem of obtaining a mechanical explanation for the phenomena of thermodynamic behavior. Professor Richard C. Tolman was a distinguished physicist who taught at the California Institute of Technology. In the course of preparing this book he consulted with many eminent colleagues including Pauling, Fowler, and Pauli, and he discussed all parts of the book with J. Robert Oppenheimer. Scholars interested in the history of science can readily appreciate the importance of this book but since it is so totally authoritative, and so elegantly written, every student and professor of statistical mechanics will find it equally valuable. No comments for "[PDF] The Principles of Statistical Mechanics (Dover Books on Physics)".